On any given day you'll find a number of events, activities and programs for the community and open to the general public. We are proud to support the many organizations bringing fun, excitement and good times to the neighborhood. Find out what's going on in Germantown and the many annual events that bring tons of visitors into the business district and neighborhood. Bring your family and friends and come have a great time in Germantown! If you have an event or meeting taking place in the neighborhood that is open to the public and benefits the community, let us know and we'll post it on our calendar and it might get a spotlight on the Community page. A 5K race centered around the Germantown business corridor and the neighborhood and is held annually on the 2nd Saturday of September. Run Germantown is organized by The One Less Foundation and benefits local non-profit organizations. The race brings die hard runners, weekend running enthusiasts, beginners and families together for fun and to support local organizations. Germantown Special Services District (GSSD) is an original sponsor of Run Germantown. Get more info: www.RunGermantown.com and save the date for September 9, 2017 - for the 3rd Annual Run Germantown! The 2nd Saturday in May kicks off the annual Second Saturday season for Historic Germantown and their historic sites. The festival is free and open to the public and includes live performances from musicians, dancers, poets, and has vendors selling their art, crafts, business services and other merchandise. 2nd Saturday's are when all 16 historic sites that work with Historic Germantown are open to the public and offer special prices for entry. Get more info: www.freedomsbackyard.com and mark your calendar for May 13, 2017! The Historic Johnson House celebrates the anniversary of Juneteenth, the passage and ratification of the 13th Amendment to the US Constitution that commemorates the end of slavery. Features include all day family oriented activities, reenactments, food, music, exhibits, vendors market and guided tours. Get more info: www.johnsonhouse.org and hold June 17, 2017 open for this fun and educational festival. Each year in the spring and fall (typically in the months of May and October) hundreds of community members come out to shop with 50+ vendors local to the neighborhood and Philadelphia in seasonal bazaars and flea markets organized by Friends of Vernon Park. 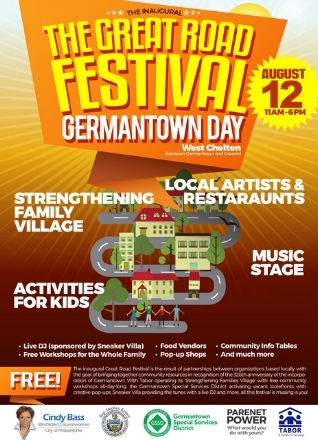 Germantown Special Services District (GSSD) sponsors the #GreatRoadFestival, with the inaugural event taking place on the 328th anniversary of the incorporation of #Germantown (Saturday, August 12, 2017) from 11 AM – 6 PM. The festival takes place in the heart of the business district and celebrates all things Germantown. Come out and support the business district and learn about all the great things happening in the district. This is a fabulous way to learn about new and growing businesses, commercial development and the health of the corridor. See what we've been up to and what we have planned for the year(s) to come and who we're honoring for the work in the community and the district.